“My God will meet all your needs according to his glorious riches in Christ Jesus” (Phil. 4:19). WOW! Have you ever been called a doodlebug? Someday you may see an odd, winding, twisting trail like something has doodled in the sand or dirt. Watch out! You are about to witness an incredible creation of God! The doodlebug’s real name is Myrmeleontidae but we’ll call it antlion. If it was larger it could be an actor in a science fiction horror movie! But its broad, flattened body, small, flat, square head, six short legs and enormous hollow jaws with needle like teeth would fit on your thumb nail! The antlion’s shovel shape and hairs that curve forward make it easy to walk backwards! Follow this bug’s trail and you might see it draw a circle in the sand, then start spiraling backwards towards the center. Its abdomen plows the sand. One front leg puts the loose sand grains on its head and then, with a smart jerk, it flips the sand out. In about 15 minutes the antlion has dug out a funnel perhaps two to three inches wide and two inches deep! The walls have the exact steepness to stay in place but collapse with a slight disturbance. The antlion then buries itself in the bottom of its funnel and waits with jaws wide open. Now watch as an ant accidentally steps inside the rim of the pit and slips on the soft sand. As it struggles to climb back up it causes tiny avalanches along the wall. 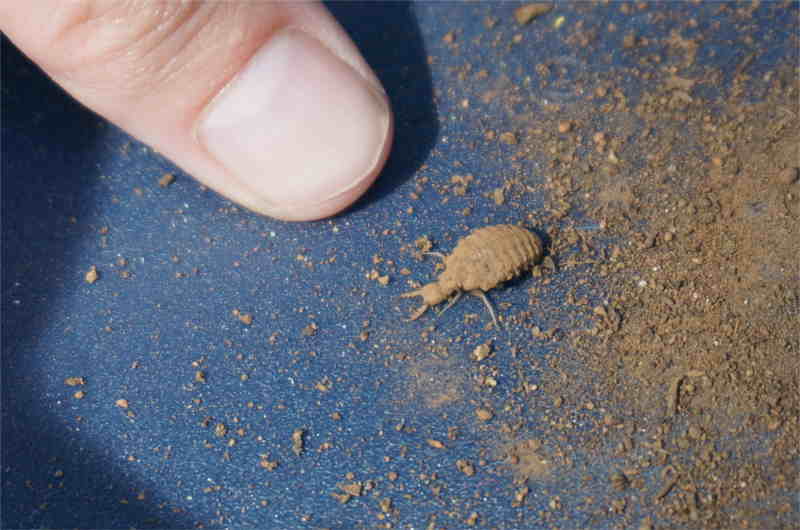 Then the incredible antlion tosses up a storm of loose sand and the ant falls to the bottom and becomes a meal! How do you think the antlion learned to walk backwards, make a circle, plow the sand, scoop it onto its head, flick it out of the way and dig such a perfect funnel? How do you think it figures out the exact angle so the walls don’t fall in on it? Our loving God created this tiny masterpiece and knew exactly what skills it would need. God designed the body parts of the antlion and programmed its brain with exactly what it needed to trap its food.